Fluid Control by Drops !! Discharge pressure 0 - 400 lg / sq.cm. These Positive displacement reciprocating pumps are provided with stroke adjustment mechanism to vary flow of liquid as per requirement. Accuracy of flow is controllable within + 1%. Of the two parts of the pump, the Drive End mechanism is enclosed in a housing filled with oil to minimise wear and tear. The Liquid End, being of critical importance, is made of material suitable for the liquid to be pumped. These pumps are self lubricating type, capable of pumping fluids of any viscosity at constant pressure, irrespective of the suction pressure variations. Pumps for continuous flow are also designed and supplied by us as per your specification. Pressure Relief Valve, Pulsation Dampner, Non Return Valve, Suction Strainers, back Pressure Valve, High / low speed Agitator. 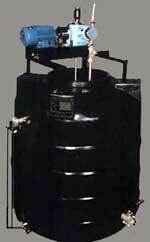 Discharge pressure 100 kg / sq.cm. The driving member in this pump is a flexible diaphragm. The advantage of this arrangement is elimination of all gland packings and seals which are exposed to the liquid being pumped. This is an important feature when used with hazardous, toxic or corrosive liquids. 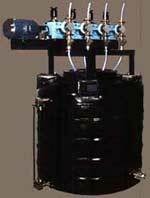 Low capacity diaphragm pumps designed for metering service employs a plunger working in oil to actuate the diaphragm. Pumps of both single and double diaphragm can be offered. Diaphragm pumps with diaphragm rupture mechanism is also offered by us. Pressure Relief Valve, Pulsation Dampner, Non Return Valve, Suction Strainer, Back Pressure Valve, High/low Speed Agitator. Discharge pressure 0 400 kg / sq.cm. Pump / Motor / Converter / Digital controller / Proximity switch. 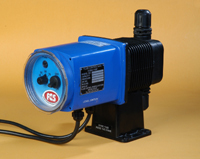 The pump can be controlled remotely giving an advantage while controlling the discharge as per your process needs. The stroke control can be varied such as Process temp., Pressure, Main Flow Rate, Level of liquid, Humidity, Viscosity, Concentration etc. Accuracy of flow is within + 1%. The controller is used to rotate the thimble with the help of converter. These are Skid Mounted Injection Systems which can be directly connected to your process systems componants required for smooth & efficient dosing. All the componants are manufactured and listed before assembly under the supervision of qualified engineers. Tank (capacity : as per requirement), Motorised agitator, Level gauge with protector, dissolving basket, Dosing pump with motor, Pulsation dampner, Pressure gauge, Pressure relief valve, Non-return valve, Strainer, Piping. • Saving of time and money . • Chemical saving upto 30%. • Accurate & continuous dosing safety of man & machinery. Discharge pressure 0 -400 kg / sq.cm. • Direct connection to system. • Highly favourable size : pressure ratio. Discharge pressure 400 kg / sq.cm. M.O.C. (liquid head) As per liquid compatibility. These are suitable for liquids which require continuous stirring. This saves the cost as a separate stirrer and of monitoring. Because of the simultaneous activities of dosing and stirring, there is saving on power consumption. Discharge pressure As per requirement. * Higher capacity & pressure can also be supplied. * Multiple head arrangement with fixed stirrer can also be supplied. 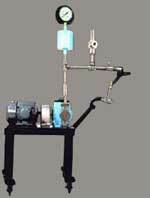 We design Jacketed Pumps for maintaining temprature of liquid being pumped. We offer Teflon Coated Jacketed Pumps for Highly Corossive Fluids. • Wetted parts suitable for most aggressive chemical. • Air bleed arrangement built into pump head. • PTFE double ball NRV s ensure long life. • Wide operating voltage range viz 180-280V. Automatic voltage compensation to ensure dosing consistency. • Level switch inter lock facility available. • Relay output : Potential free change over contact which activates in the event of pump malfunction. • Fault L.E.D. : Gives visual indication of blown fuse, low level in chemical tank or over heating of pump.